Allied naval officers received, on April 10th 1944, confirmation of a landing in the north of France and more precisely on the coasts of Basse-Normandie. The operation of transporting men and equipment across the English Channel, codenamed Neptune, is supervised by the commander-in-chief of the allied fleet: Admiral Bertram Ramsay. Crossing the English Channel is a key element of Operation Overlord. This is a key for success which would allow the Allies to install a bridghead in ennemy territory. For there are many possibilities of pitfalls: poor coordination between the fleets, error in navigation of one or more convoys, minefields, attacks by U-boote (submarines) or E-Boote (torpedo boats), massive intervention of the Luftwaffe (German air force), damages to a large number of key warships within the armada, the rise of the storm in the English Channel at the beginning of June 1944. Admiral Kirk led the American sector (Western Task Force): Force U (for Utah) positioned in Plymouth, Force O (for Omaha) positioned in Portland. As for the British-French-Canadian sector ([Eastern Task Force), it felt under the responsability of Admiral Vian: Force S (for Sword) positioned at Portsmouth, Force G (for Gold) positioned at Southampton, and Force J (for Juno) positioned at the Isle of Wight. All the warships participating in Operation Neptune have left their home ports at different times according to their geographical location in Great Britain and had to make their way off the southern England coasts. A large gathering area was planned, codenamed “Z”, nicknamed “Piccadilly Circus” (in reference to this busy axis of central London). The “Z” point was located 30 kilometers south-east of the Isle of Wight, and was the break-up point of the allied armada that then splited into five convoys heading for their respective landing beaches. They had to make their way through five channels previously opened by minesweepers. The British chose to mark two of their three areas of responsibility (Juno Beach in the west and Sword Beach in the east) by the intervention of ten sailors on board two submarines. This markup mission is called Operation Gambit. The Americans, for their part, did not wish to organize equivalent missions for their own area of responsibility. An impressive storm was formed in the English Channel as early as Saturday, June 3rd, 1944. Allied meteorologists were particularly concerned about the consequences of this climatic event on the smooth running of Operation Neptune. 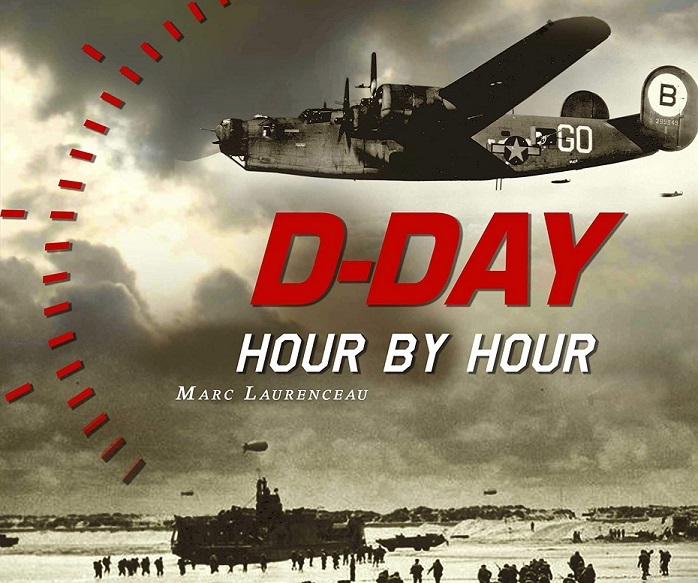 Initially scheduled for June 5, 1944, the convoy had to make way the day before, June 4, and cross the Channel during the night. General Eisenhower decided, due to an improved weather forecast, on 4 June at 04:15: “Overlord will take place tomorrow, June 5”. And it was at dawn of June 4th that the first elements of the invading fleet set out for Picadilly Circus. But they were called back a few hours later, the weather being even a little more execrable. 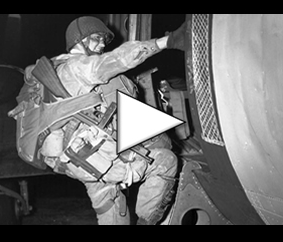 Men had to wait 24 more hours; for the assault troops who were already aboard transport ships for 5 days, this was no longer for them but a small delay. But a flotilla did not receive the message and continued its course. This became a critical problem for the Allied General Staff: if these elements were detected by the German radars, the entire operation Neptune (and therefore Overlord) would be in jeopardy. Fighters were put on alert and then sent urgently to order the return using light signals. The convoy finally changed its way and returned to its initial point. Taking all responsibilities in this matter, General Eisenhower decided that the Normandy landing would begin the day after tomorrow, according to favorable meteorologists forecasts. The next day, at dawn of June 5, 1944, the invasion fleet resumed the direction of Normandy and this time for good. 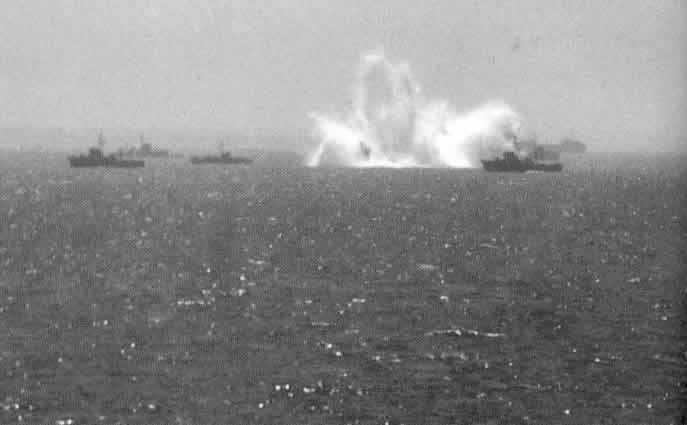 During this long-awaited crossing, the first ships put in place a smoke screen that is supposed to protect the Allied Armada from German submarines and E-Boot torpedo boats. 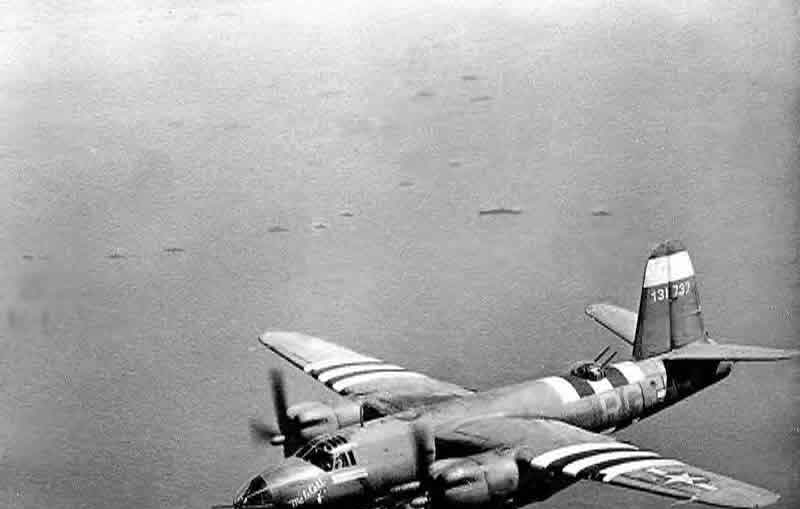 Aircraft were also responsible for dumping smoke in protection of the convoys: one of the squadrons involved was the 342th Squadron Lorraine 1/20, made up of crews of FAFL (Free France Air Force) with 6 Douglas Boston bombers. It carried out its mission from the Pointe de Barfleur to the islands of Saint-Marcouf. During the crossing, orders given to the officers commanding the warships were clear: they had to open fire on all aircrafts flying over the fleet at low altitude, whether friends or foes. Allied pilots were warned, they should not descend below a certain altitude. To protect the various ships of the allied armada from any low-level air attack, most of them were equipped with a captive balloon flying several tens of meters above their structure. This balloon was connected to the ship by a steel cable. The balloon did not prevent air attacks itself: the steel rope could cut the wings of airplanes. On the flanks of the allied armada, twenty-four destroyers, anti-submarine warfare patrols and coastguards were in charge of protecting the convoys. In addition, a squadron of two battleships, eight cruisers and twenty destroyers was placed in the North Sea to oppose a possible intervention of the Kriegsmarine from this maritime region. In an attempt to mislead the German navy, an allied squadron of small boats transmitting fake radio communications left England on June 5th in the evening towards the northern coast of France. The German surveillance operators observed large echoes on their radars on June 6th at one o’clock in the morning and gave the alarm: for Germany, the Allied assault was taking place, off the Pas-de-Calais. Nothing had to delay the allied armada: if a ship was damaged and was no longer able to keep going, it had to make way for the other ships without departing from the road cleared by the minesweepers. Patrol boats were then tasked to tow the damaged ships. The first elements of the allied armada arrived in sight of the coasts shortly after midnight on June 6th. Ships then anchored ten nautical miles from the beaches and some were spotted by German sentries, especially at Omaha Beach. These soldiers (especially on the Wn 62 strongpoints at Colleville-sur-Mer) send even from one o’clock in the morning white flares to request identification from the ships which, of course, did not respond. Off Le Havre, four German E-Boots torpedo boats emerged from the screen smoke and went face-to-face with the allied fleet and the Force S (Sword) convoy: they fired their torpedoes then disappeared through the artificial protective cloud. One of the two Norwegian warships engaged in Operation Neptune, the Svenner, was hit and sunk. 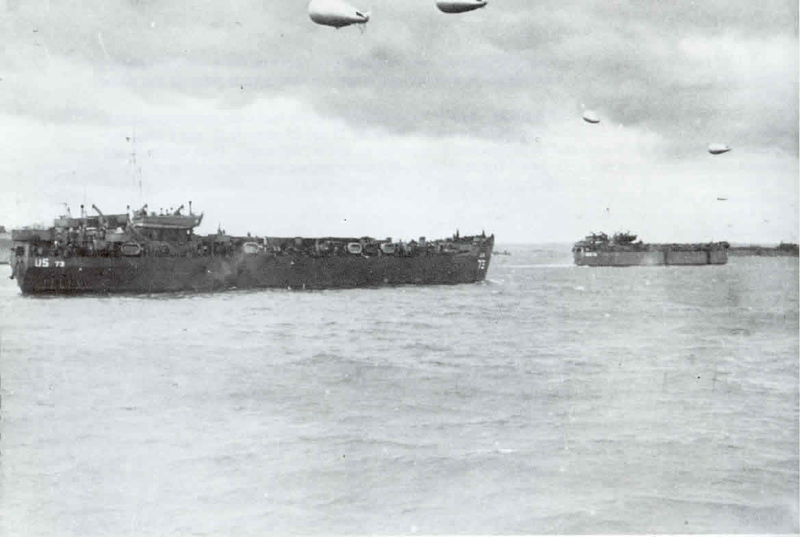 Survivors were recovered by surrounding ships. This was the major incident of the English Channel crossing. Elements of Force U were responsible for supporting the landing of several US teams on the St. Marcouf islands, two islets a few tens of square meters located off Utah Beach. The Allies were convinced that the Germans had placed on the ruins of an ancient bastion built by Napoleon III an advanced observation post (German soldiers had been spotted by air reconnaissance on the largest of the two islands in May 1944). At 4:30 am, 132 soldiers of the 4th and 24th Cavalry Squadrons landed there. The other Allied military personnel took a quick breakfast and boarded the landing crafts, waiting for the order of departure towards the beaches. Then, at 5:10 am, the naval artillery began firing until 5:50, 30 minutes before the beginning of the landing operations. 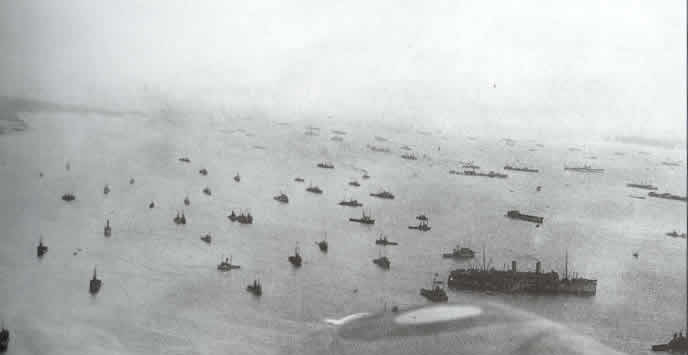 The crossing of the English Channel, very well planned, took place successfully despite several losses. This success offered a total surprise effect as well as the assurance of starting the Overlord operation under the best conditions.